Manager Chris Coleman says the return of Sam Vokes is a timely boost ahead of Wales' Euro 2016 qualifier against Israel on 28 March. The striker suffered a serious knee injury in March 2014 and is yet to feature in Wales' campaign. The 25-year-old has made six appearances since making his Burnley comeback on 26 December and scored against Spurs in the FA Cup. "Sam gives us something a bit different," Coleman said. "It's great news he's back." Vokes ruptured his anterior cruciate ligament in a 2-0 Championship defeat to Leicester and he missed out on Burnley's promotion to the Premier League. The former Bournemouth and Wolves striker has not played for Wales since he scored in a 3-1 friendly win over Iceland on 5 March, 2014. 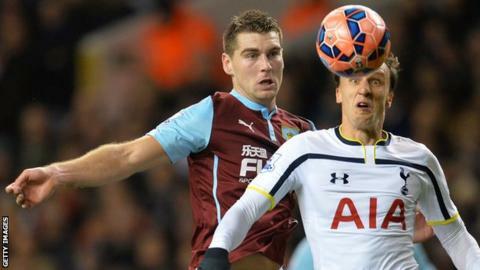 But Vokes joined up with Coleman's squad ahead of the Group B opener in Andorra in September 2014 and the national team manager is pleased he is back in action after he returned as a substitute in Burnley's Boxing Day defeat by Liverpool. "A cruciate ligament [injury] in football is a serious one and we knew we'd get him back sooner or later," Coleman added. "But testament to him he's come back quite early. "He's had some minutes already with Burnley and hopefully between now and the Israel game he'll get 90 minutes under his belt." Wigan Athletic midfielder Emyr Huws will miss the trip to Israel and is out for the rest of the season after suffering an ankle injury during training. Defender James Chester also faces a race to be fit for the game in Haifa on 28 March after having an operation on a shoulder he dislocated in Hull City's 3-0 defeat against West Ham in January. Chester, 26, has become a key member of Coleman's side since he made his Wales debut in a friendly against the Netherlands in June 2014. "We've got to see how he progresses and I'm hoping he's going to be fit because he's been brilliant," Coleman said. "He's done a great job for us since he's come in. He's a great lad and a great professional. "James has got the type of personality who will relish the battle in Israel."